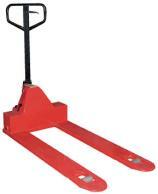 Pallet Trucks or pump trucks are tools used to lift and move pallets. This proven ergonomic design has been time tested for providing years of reliable usage. An economical way for one person to move heavy pallet loads without the use of a fork truck. Ergonomic design requires just 75 lbs. of pulling force when fully loaded. Spring loaded loop handle automatically returns to vertical position when not in use. Chrome-plated hydraulic pump piston for long seal life. The Low Profile Pallet Truck enters pallets from all four sides. All steel frame is reinforced to handle 4,000 lb. capacity loads. Wide loop control handle with lift, neutral, and lower functions provides fingertip control. Lifetime lubricated bearings. Hydraulic system has hard chrome plated pump piston with polyurethane seals. Suspension system has a heavy duty thrust bearing. Complete with adjustable push rods, polyurethane wheels, steel load rollers and red powder coated finish. Transport long loads down narrow aisles with this heavy duty Sidewinder Pallet Truck. This versatile Pallet Truck retains all the quality workmanship of a standard pallet truck in addition to providing lateral movement. Simply place the forks into the pallet then elevate to approximately seven inches, rotate handle, and lock detent into place. The second set of rollers, right/left, are actuated. Now push the Side Winder perpendicular to the traditional direction. Move long loads down narrow aisles! 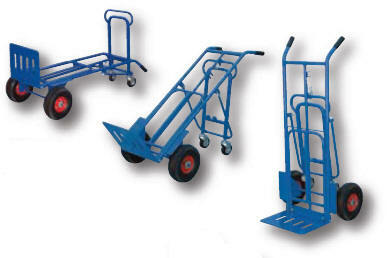 This hand truck is great for uneven surfaces and outdoor work. Small 4" x 1-1/4" mold-on-rubber swivel casters are located at the back of the cart to stabilize loads and prevent tipping. The back casters will also transform the unit into a horizontal platform truck. The unit will lie back horizontally, the handle will release to a standard position and now the cart is a platform truck. 10" x 3-1/2" pneumatic casters.